All of the excessive, abusive tactics employed by the government today – warrantless surveillance, stop and frisk searches, SWAT team raids, roadside strip searches, asset forfeiture schemes, private prisons, indefinite detention, militarized police, etc. – will eventually be meted out on the general populace. At that point where you find yourself subjected to dehumanizing, demoralizing, thuggish behavior by government bureaucrats who are hyped up on the power of their badges and empowered to detain, search, interrogate, threaten and generally harass anyone they see fit, remember you were warned. 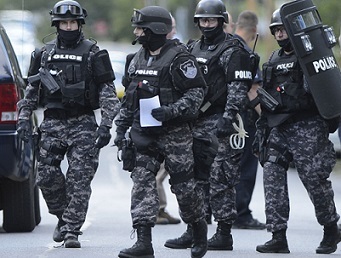 Nationwide, SWAT teams are assigned to carry out routine police work such as serving a search warrant or an arrest warrant for nonviolent offenders. In 1980 there were roughly 3,000 SWAT team raids. Today that number has grown to more than 80,000 a year. SWAT teams frequently invade US citizens’ homes in the middle of the night, frightening homeowners and their families, damaging furnishings, and often endangering innocent people’s lives. In the state of Maryland alone, 92% of 8,200 SWAT missions were used to execute search or arrest warrants. Police in both Baltimore and Dallas have used SWAT teams to bust up poker games. A Connecticut SWAT team swarmed a bar suspected of serving alcohol to underage individuals. In Arizona, a SWAT team was used to break up an alleged cockfighting ring. An Atlanta SWAT team raided a music studio, allegedly out of a concern that it might have been involved in illegal music piracy. A Minnesota SWAT team raided the wrong house in the middle of the night, handcuffed the three young children, held the mother on the floor at gunpoint, shot the family dog, and then “forced the handcuffed children to sit next to the carcass of their bloody pet for more than an hour” while they searched the home. A California SWAT team drove an armored Bearcat into a man’s yard, surrounded his home with paramilitary troops wearing face masks, tossed a fire-starting flashbang grenade into the house and when the owner appeared at a window, unarmed wearing only his shorts, held him at bay with rifles. He died of asphyxiation from being trapped in the flame-filled house. Turns out he was misidentified as someone involved in a shooting. And then there was the police officer who tripped and “accidentally” shot and killed an unarmed grandfather of 12 while the SWAT team attempted to execute a search warrant against his stepson. Equally outrageous was the four-hour SWAT team raid on a California high school, where students were locked down in classrooms, forced to urinate in overturned desks and generally terrorized by heavily armed, masked gunmen searching for possible weapons that were never found. What we are witnessing is an inversion of the police-civilian relationship. Rather than compelling police officers to remain within constitutional bounds as servants of the people, ordinary Americans are being placed at the mercy of militarized police units. In another subset of cases, such as the Department of Education raid on Anthony Wright’s home, police conducted a search of a building where the suspect no longer resides. If you’re wondering why the Education Department needs a SWAT team, you’re not alone. Other federal agencies with their own paramilitary units are the State Department, the Department of Energy, U.S. Fish and Wildlife Service and the National Park Service, to name but a few. Judges tend to afford extreme levels of deference to police officers who have mistakenly killed innocent civilians and few are ever punished. However, they do not afford similar leniency to civilians who have injured police officers in acts of self-defense. Even homeowners who mistake officers for robbers can be sentenced for assault or murder if they take defensive actions resulting in harm to police. No more do we have a civilian force of peace officers entrusted with serving and protecting the American people. Instead, today’s militarized law enforcement officials have shifted their allegiance from the citizenry to the state, acting preemptively to ward off any possible challenges to the government’s power, unrestrained by the boundaries of the Fourth Amendment. Heavily armed police officers, the end product of the government, both federal and state, and law enforcement agencies have become a “standing” or permanent army, composed of full-time professional soldiers who do not disband. Yet these permanent armies are exactly what those who drafted the U.S. Constitution and Bill of Rights feared as tools used by despotic governments to wage war against its citizens. This phenomenon we are experiencing with the police is what philosopher Abraham Kaplan referred to as the law of the instrument, which essentially says that to a hammer, everything looks like a nail and we the citizenry have become the nails to be hammered by the government’s henchmen.